Hey everyone! After many requests, today's post will be the beginning of HNOW's Womens Wardrobe Essentials segment. In this segment I will feature the top 10 items every woman should have in their closet. This segment is really opening my eyes to what I already have and what I've been buying for no reason. So I've made a list, checked it twice, and I'm ready to get started! Ready? We'll start things off with The Leather Jacket. 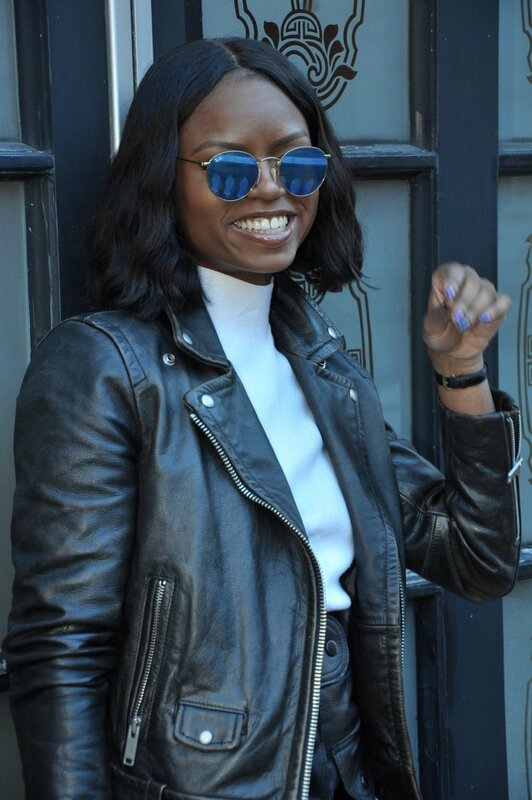 The leather jacket has got to be one of my favorite staples for the Fall. (Staple pieces are items you will always need.) The leather jacket has been apart of American culture from as early as the 1900s. Military men and aviators wore brown leather jackets (later nicknamed "bomber jackets") due to their warm insulation. In 1928 the first motorcycle jacket (just like the one pictured above) was sold for $5.50 at the Harley Davidson store in New York City. Fast forward to 1983, when Michael Jackson fearlessly rocked an ionic red leather jacket in his 13- minute video for "Thriller" - the leather jacket undoubtedly is the epitome of cool. 1. The leather jacket is not only for the boys! Yes, it definitely is a bit more masculine but it works well with every sense of style. Worn with all black, all white, ripped jeans, maxi skirt, sweater dress, leggings - everything! The leather jacket is a perfect touch of edge without looking too grungy. 2.The leather jacket is also smart investment. It's not 1928, and I know quality leathers are no longer $5.50. But purchasing a real leather jacket will be worth it! Real leather can stand the tests of time. I've owned my leather for about a year now and its still in great shape. At this rate I can keep it for about two more years. 3. No two will ever be the same! Yes, two leathers might be purchased from the same store and look identical but in a few years it will be weathered and will fade (only a little) and will tell a story. Talk about personal customization! From the arms, to the zippers, to the epaulets (the button flap on the shoulder) the more worn it is, the better it will look. 4. There are so many different styles! Quality leathers usually come in motorcycle or bomber styles. So even if you cant afford a real leather right now, you're in luck because the cheaper leathers come in so many different trendy styles and colors. Would you want to spend $300+ on a royal blue leather that you might not wear in 5 years? I don't think so. But $35 dollars doesn't sound too bad to me! All these jackets came from Forever21! Pop your collar, put on a bold lip and kill the game! There are nine more items that you should always have in your closet. Can you guess what's next? Here's a clue: Dem Franchize Boyz.